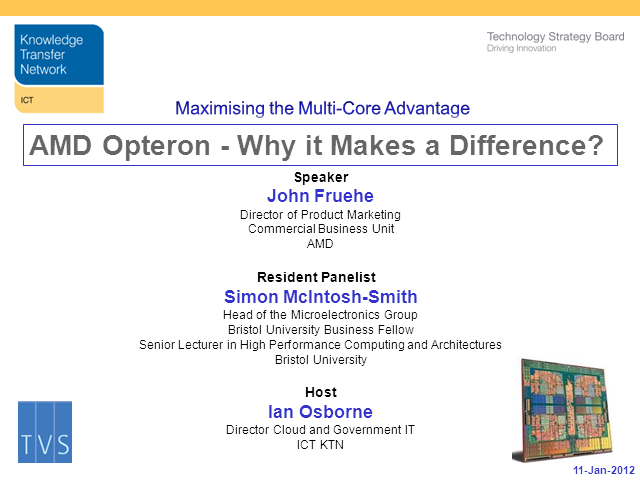 Maximising the Multi-Core Advantage â AMD Opteron - Why it Makes a Difference? John Fruehe will be presenting the AMD Opteron 6200 and 4200 series CPU and providing an overview of the features and benefits of the new Bulldozer architecture. In particular, how the core count and power saving features provide advantages to real world applications in terms of scalability and performance. Title: Maximising the Multi-Core Advantage â AMD Opteron - Why it Makes a Difference?